B Condensed Consolidated Interim Financial Statements 49 Consolidated Balance Sheets 50 Consolidated Income Statements 51 Consolidated Statements of Comprehensive Income 52 Consolidated Statements of Changes in Equity 53 Consolidated Statements of Cash Flows 55 Notes Interim Report Third Quarter and First Nine Months of 2014 Allianz Group 59 To better understand the ongoing operations of the business, the ­Allianz Group generally excludes the following non-operating effects: −− acquisition-related expenses and the amortization of intangible assets, as these relate to business combinations, −− interestexpensesfromexternaldebt,astheserelatetothecapital structure of the ­Allianz Group, −− income from fully consolidated private equity investments (net), as this represents income from industrial holdings, which is out- side the ­Allianz Group’s normal scope of operating business, −− income from financial assets and liabilities carried at fair value throughincome(net),asthisdoesnotreflectthe­AllianzGroup’s long-term performance, −− realized capital gains and losses (net) or impairments of invest- ments (net), as the timing of sales that would result in such real- ized gains or losses is largely at the discretion of the ­Allianz Group and impairments are largely dependent on market cycles or issuer-specific events over which the ­Allianz Group has little or no control and which can and do vary, sometimes materially, through time, −− one-off effect from pension revaluation. ­Allianz SE has a joint liability for a large part of the pension provisions of its German subsidiaries. Service costs incurred in this context are reim- bursed by the German subsidiaries of ­Allianz SE, resulting in corresponding service revenues at ­Allianz SE. Effective 1 January 2014, the German subsidiaries of ­Allianz SE changed the applica- tion of the option provided by article 67 (1) sentence 1 of the Introductory Act to German Commercial Code (EGHGB) to dis- tribute the conversion expenses due to the first-time application of the German Accounting Law Modernization Act (­BilMoG) in 2010 over a period of up to 15 years in the way that the conversion expenses were fully recognized in the first quarter of 2014. The resulting one-off expenses at the German subsidiaries and one- off income at ­Allianz SE are shown as non-operating items. In case of policyholder participation within the Life/Health insur- ance business, this one-off effect is presented within operating profit. On the ­Allianz Group level, the one-off expenses and income offset each other. 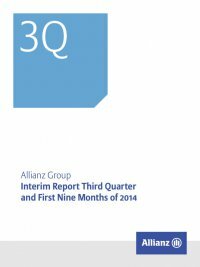 The only impact on the ­Allianz Group level is the related policyholder participation, which had a posi- tive impact of € 117 mn on income before income taxes for the nine months ended 30 September 2014. The following exceptions apply to this general rule: −− In all reportable segments, income from financial assets and liabilities carried at fair value through income (net) is treated as operating profit if the income relates to operating business. −− For Life/Health insurance business and Property-Casualty insur- ance products with premium refunds, all items listed above are included in operating profit if the profit sources are shared with policyholders. This is also applicable to tax benefits, which are shared with policyholders. IFRS requires that the consolidated income statements present all tax benefits in the income taxes line item, even though these belong to policyholders. In the seg- ment reporting, the tax benefits are reclassified and shown within operating profit in order to adequately reflect the policy- holder participation in tax benefits. Operating profit should be viewed as complementary to, and not as a substitute for, income before income taxes or net income as deter- mined in accordance with IFRS. Recent organizational changes Effective 1 January 2014, the ­Allianz Group prospectively allocated certain entities from the reportable segment Asset Management to the reportable segments German Speaking Countries, Western & Southern Europe and Growth Markets within the business segment Life/Health and to the reportable segment Banking.